The above shot was captured using a Canon EF-S 55-250mm lens and then cropped in Adobe Lightroom. 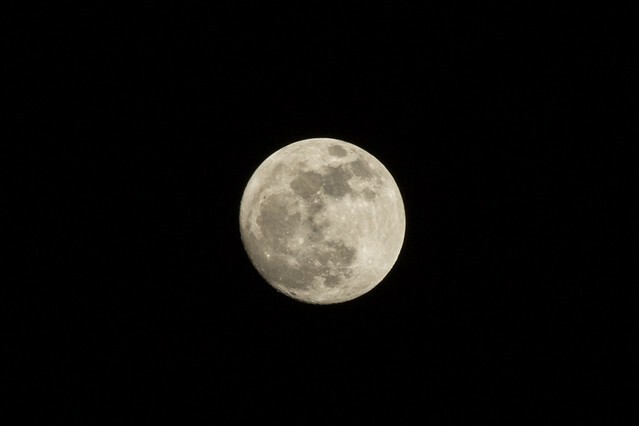 The results were pretty good and you can see a lot of details on the moon’s surface. Since Vince’s tests came out as good we decided we would try and setup somewhere in the desert and try to capture the Supermoon on Saturday. Saturday proved to be somewhat of a challenge. There was cloud cover on the Franklin Mountains and we weren’t quite sure where the moon was going to arrive over. He had met at my house and were getting our stuff packed and missed that the moon had come through the clouds. it had been obscured by a two story house next door. We quickly scrambled and headed for the hills by the Sunland Park airport. The orange color is interesting and while I used the same settings I’d used in my tests, the moon was fuzzier in all of our shots. This was the best of my batch. I guess the color change or cloud haze might have caused some focusing issues. We goofed around with some other shots, yielding mixed results. 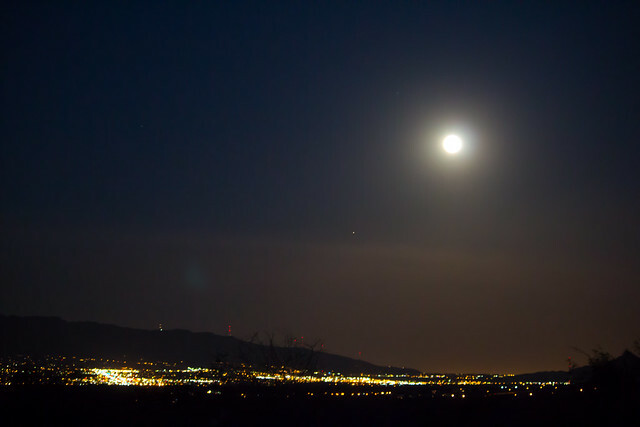 This was the best of my long shots trying to get the city lights and mountains in the shot. Next year we’ll be better prepared and try again.